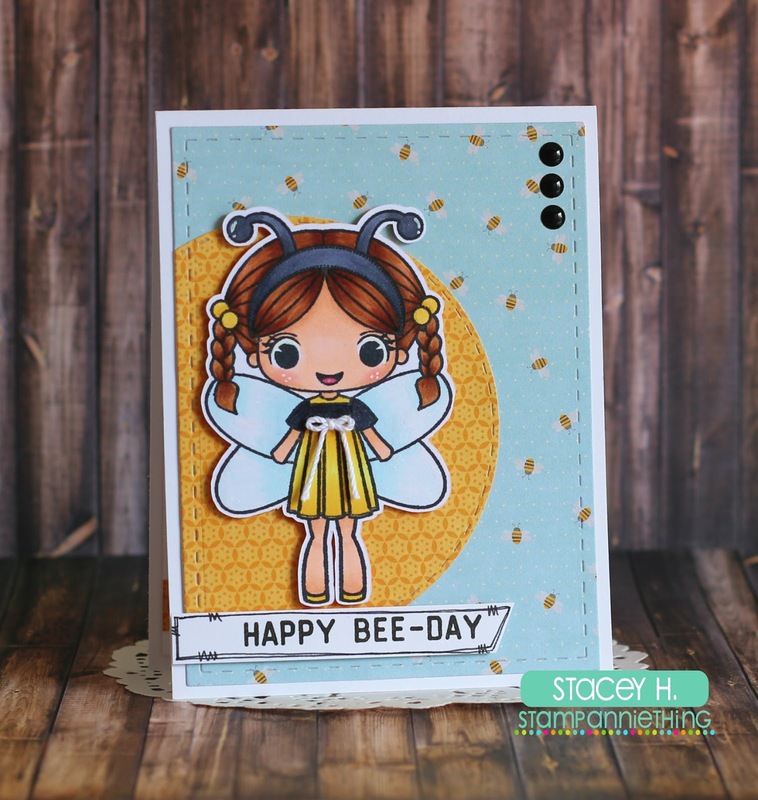 Stacey from Stacey's Creative Corner here with you today and I have a sweet card to share with you that I made using the Lorelei - Bee stamp. I created an A2 card base from some white cardstock and added some fun bee patterned paper that I cut out with the Card Mat Dies from Jaded Blossom to get that fun stitching. I used the Stitched Circle Dies, also from Jaded Blossom, and cut off the edge. I colored up that sweet little Lorelei - Bee with my Copics and used my Scan N Cut 2 to cut her out. I popped her up with some foam tape and added my greeting from Jaded Blossom's Love Stings (revamped) underneath with more foam tape. I finished off my card with a fun little bow on her dress and some enamel dots in the corner of the card. 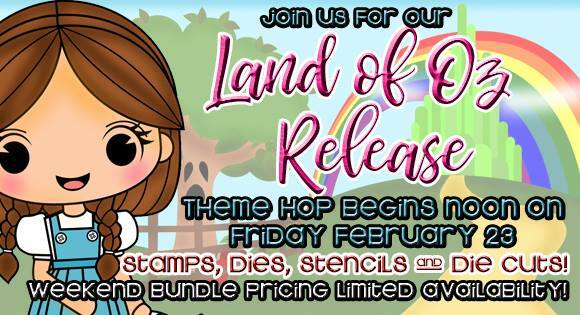 Welcome to our first ever THEMED Hop Event! 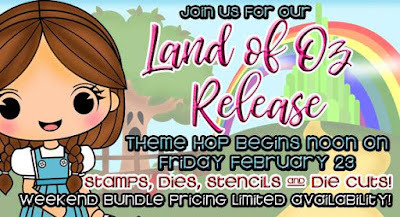 We are thrilled to have you join us for our Land of Oz release! 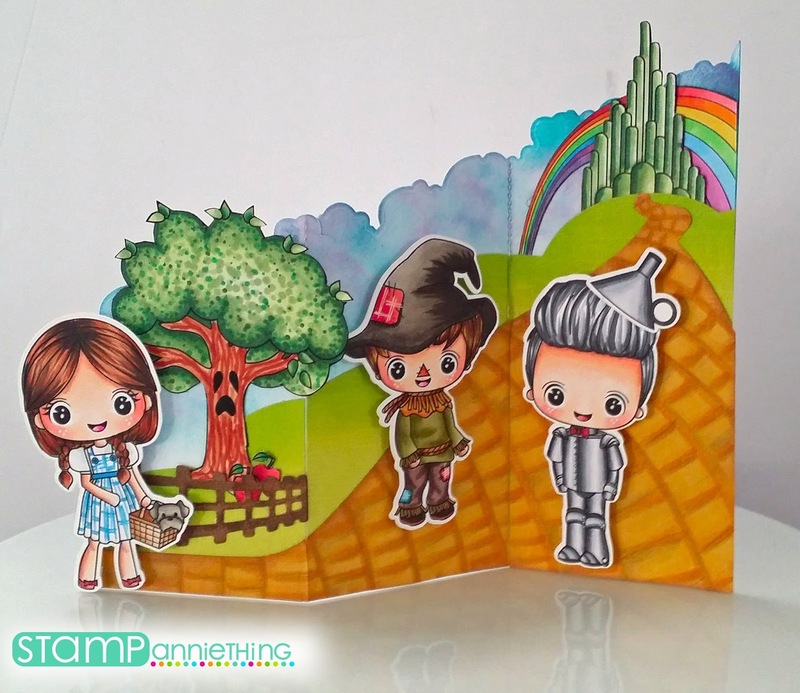 This theme hop consists of wonderful inspiration from our DT using the new Land of Oz stamps! This weekend you can get the Hop Bundle at a discount, while supplies last! You can ONLY get it at this price from today until Sunday at 11:59 pm Eastern. Check out all you will receive with the special Hop Weekend prices! 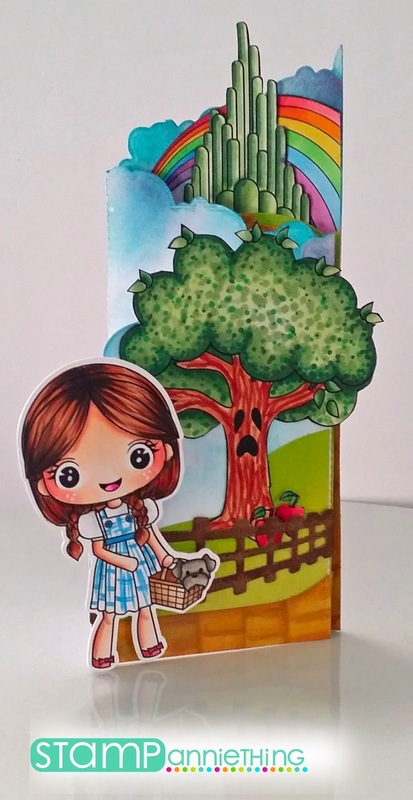 The bundle includes SIX of our newest stamps in the Oz theme, a set of 6 Metal craft dies, a set of Decorative Die cuts (36 pcs per pack) and a Tree Stencil! 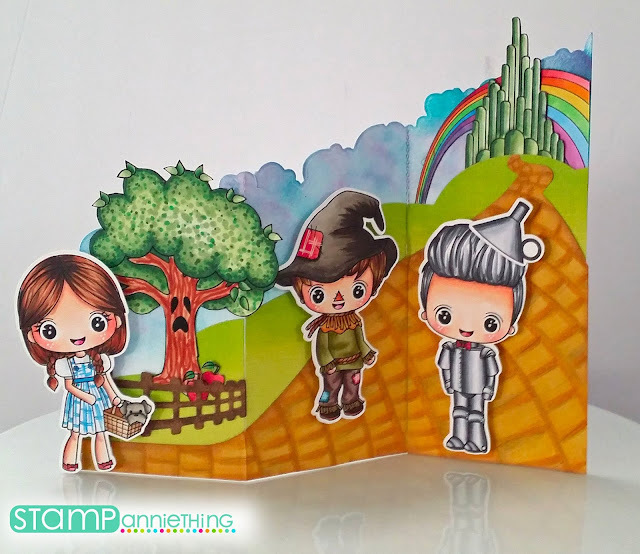 By using all of these elements together you can create many wonderful Land of Oz scenes and projects for years to come! Remember the special pricing is ONLY GOOD FOR THE WEEKEND! Want a chance to WIN a bundle set? 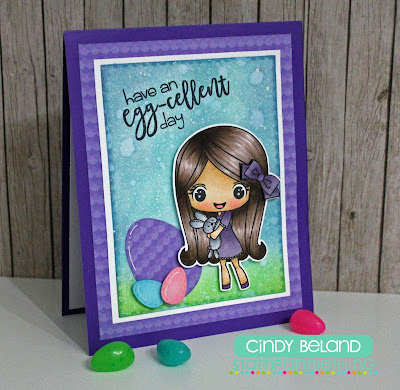 Simple make sure to follow along on this blog hop and leave some blog love (comment) on each and every Design Team members post!) Also make sure you are a follower of their blog and we will randomly pick ONE person to win a Bundle set! 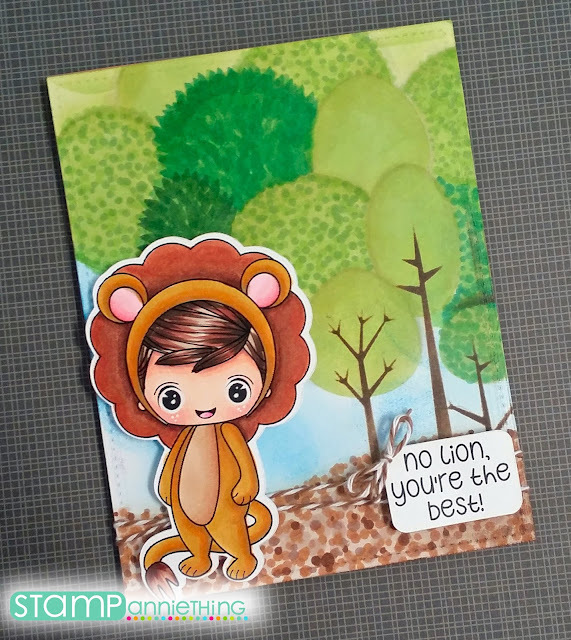 First I made a cute card with the Zac as the Lion image. I used the Tree Stencil to create my "forest" background and just tried to add some dimension to the different tree tops to separate them from one another. Next I created a cute and girlie Shaker Card with the Glinda stamp. I had these adorable tiny star confetti that I thought looked a little magical. 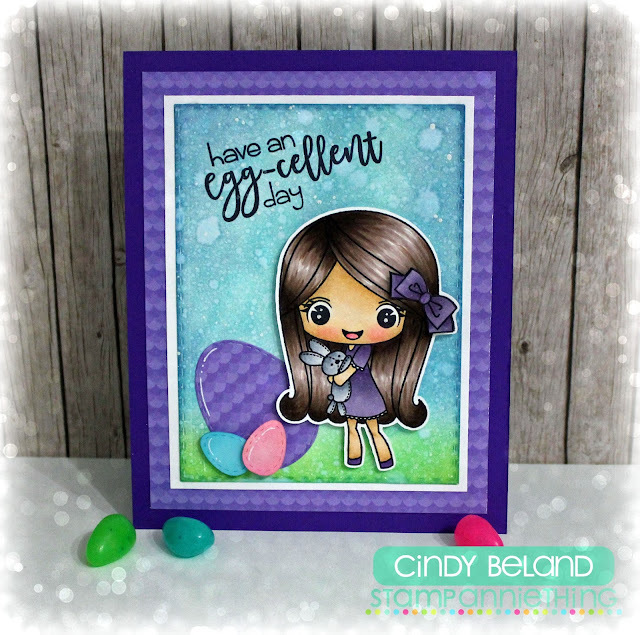 I used a Queen and Company shaker card kit and made my background using the Tree stencil. You can use this stencil in many ways, not just for trees! 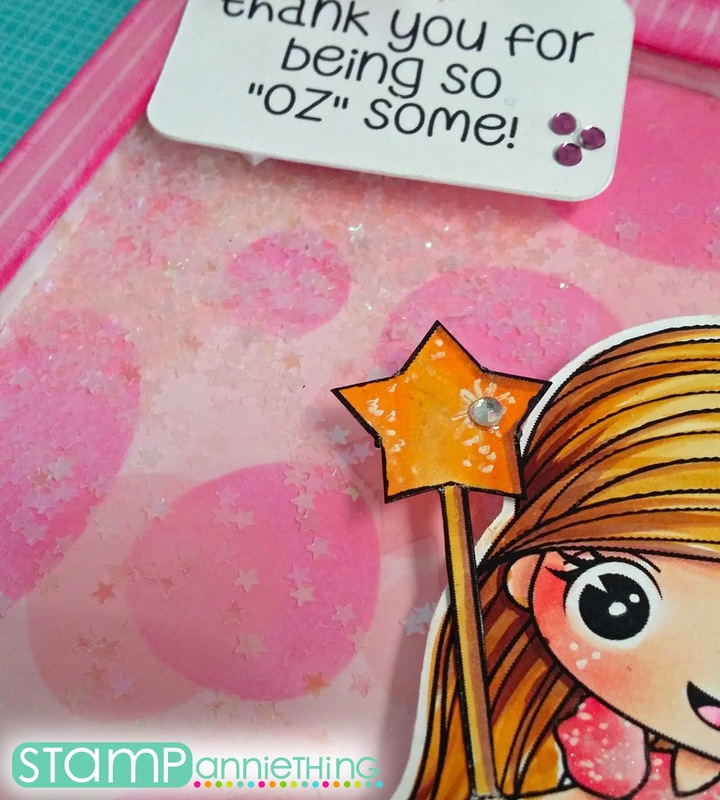 I masked the wand from the stamp set and then fussy cut it and placed it in her hand. 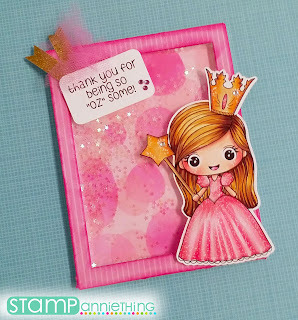 I repeated the same for her "crown"
Lastly I created this adorable tri fold accordian card to create a scene for my stamps. I used several of the Metal Die Builders (fence, cloud line, hill line and yellow brick road), I also used the Tree, Emerald City and Rainbow from the decorative Die cut packs to help create the scene. I hope you enjoyed our Land of Oz Themed Hop! Please continue Hopping by using the following Blog Line Up! 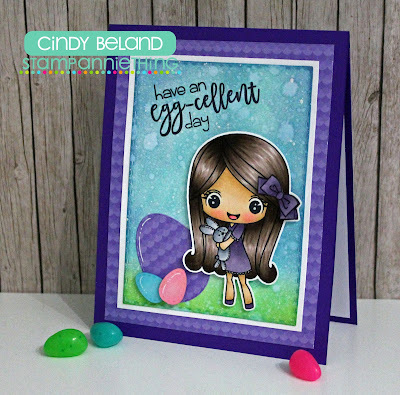 Jaded Blossom I used Spring Dies for the big egg, the Spring Banner Dies for the smaller eggs, the Follow the Easter Bunny for the sentiment and the Rectangle Dies 1 for the bottom layer. I colored my girl with copics and the background with Distress Oxide inks!!! Hi everyone! 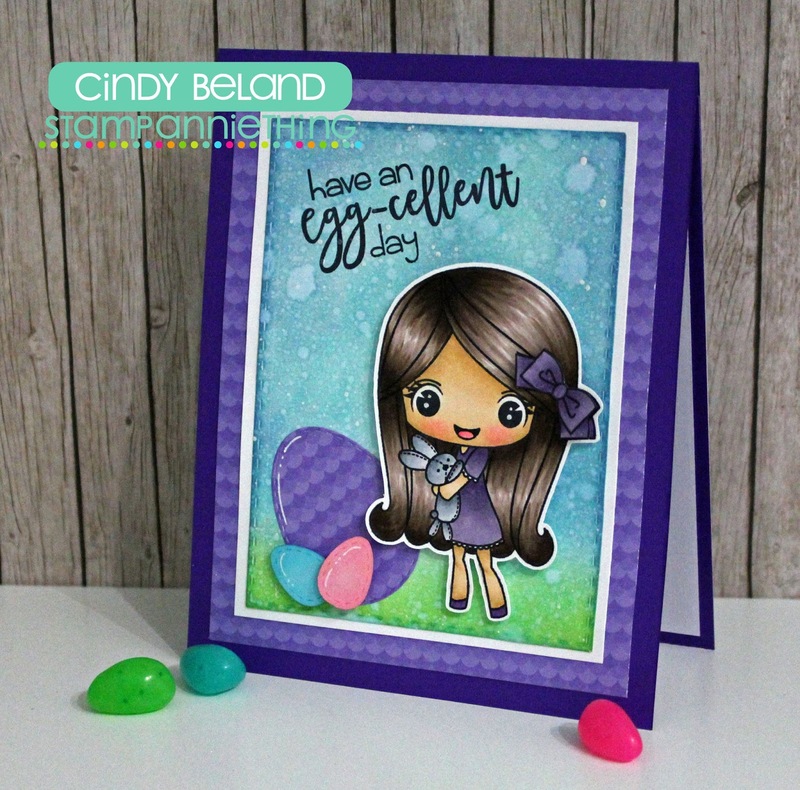 This is Tina from The Scrappin Rabbit Blog and I have a card to share featuring the adorable Taylor- So Beary Sweet. I stamped, embossed and colored up this cutie with Copics. I chose Spring colors for my design. 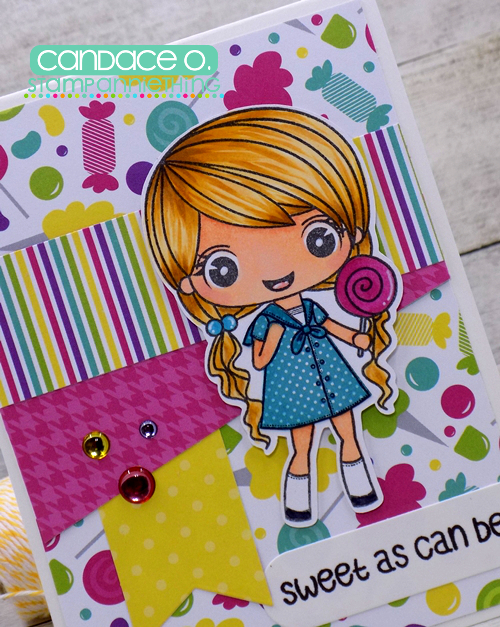 I added pink polka dots to her cute little dress and decorated with a flower border using dies from Jaded Blossom. Thank you so much for stopping by! 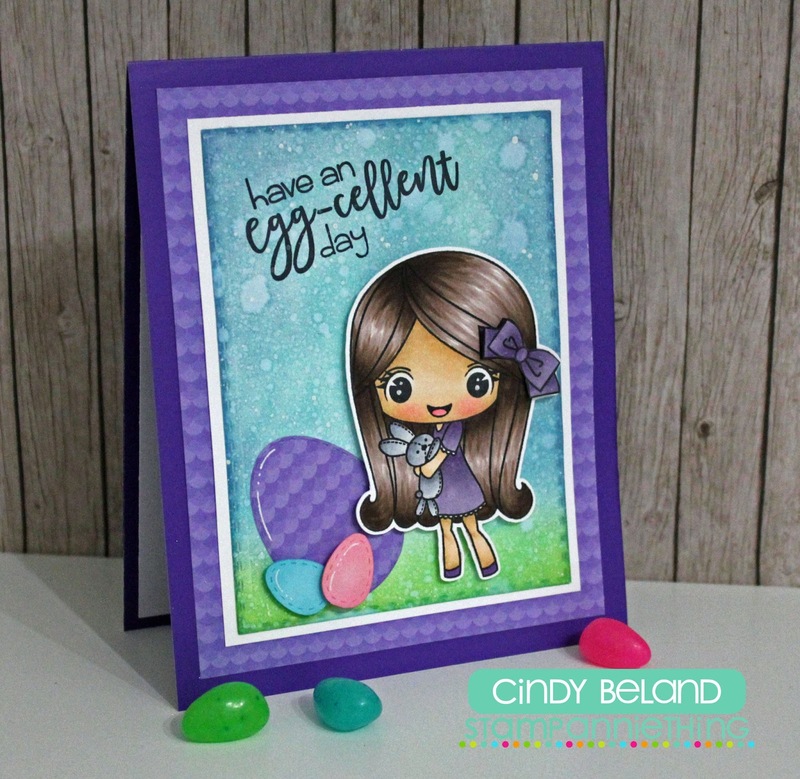 Hope you like my card :) Have a great day!